Nuclear metallurgists, materials scientists and engineers, nuclear facility operators and regulators, consultants, researchers and academics working in this field. Dr. Damien Feron is Director of Research at the Nuclear Energy Division of the Atomic Energy and Alternative Energies Commission (CEA) and Professor at the National Institute for Nuclear Science and Technology (INSTN), France. 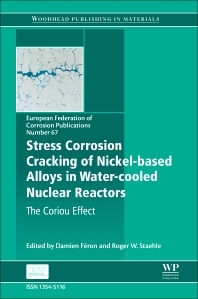 He is also Chairman of the Nuclear Corrosion Working Party (WP4) and of the Science and Technology Advisory Committee (STAC) of the European Federation of Corrosion (EFC). He is world-renowned for his leadership and research in the field of nuclear materials corrosion and its mitigation. Roger Staehle is very well-known and has been active in the nuclear corrosion community for over 60 years. He is a Retired Professor of the Department of Chemical Engineering and Materials Science at the University of Minnesota and an industrial consultant. He has edited 29 volumes and published 220 papers. among other honors, he was elected to the (US) National Academy of Engineering and received the Willis Rodney Whitney Award. He has consulted for many industries, including the nuclear one, and for governments in the United States, Japan, China and Korea.